For nearly three years, students all over Quebec have been organizing protests and strikes to pressure the province to provide remuneration for all internships. Seventy-seven per cent of students do not receive any form of remuneration during their internships, according to Fédération étudiante collégiale du Québec and the Union étudiante du Québec, and this issue is primarily found in sectors with a majority of women workers. During the fall semester, a broad coalition of student associations across the province announced they would kick off an unlimited strike if their demands were not met. In November, about 58,000 students across Quebec held a one-week strike. This winter, consultations were held between students and the ministry of higher education. In February, the FECQ and UEQ proposed a bill to improve internship conditions in the province. This would include being recognized under Quebec’s Labour Code, giving them minimal protection without having to contribute to the Commission des normes, de l’équité, de la santé et de la sécurité du travail, as well as being protected by workplace incident laws. They encouraged Higher Education Minister Jean-François Roberge and Labour Minister Jean Boulet to take their work into consideration when the Labour Code is updated again. “The next budget is a great opportunity for the government, and one that shouldn’t be missed. Roberge said he will be releasing his plan for internship remuneration in response to the strikes at the end of April. With that, the unlimited strike has already begun. On March 19, approximately 135 students sent an open letter to Roberge and the education ministry. The letter is notably demanding demanding the payment for all hours of internships. The open letter put forward arguments why internships should be paid, and requested the minister impose actions for things to change, especially for women. Another protest was held by UQAM at Place Émilie-Gamelin the next day. In the same week, the provincial budget came out. Students had been pushing to see a portion of that budget allocated to paying interns, but in the end, Roberge said no announcements on that would be made until next year’s budget. Students protested in Montreal on March 21 under the banner “J-F t’es mieux d’avoir notre cash,” organized with the help of UQAM students. Laurie O’Neil, a second-year nursing student at CEGEP Garneau in Quebec City, said she has to work 24 hours a week in a hospital. Since she lives with her parents, she said she can get through it, but the problem is that with school and other obligations, she can only work eight hours a week at her other job. “CEGEP administrators give us the argument that they do not have the money to pay for internships, so internship days would be almost entirely reduced if they were paid. However, during internships, one should not be a CEGEP employee, but an employee of the hospital because we work with their team. In the same way as employees, even if you are a student, you still work hard in the same guideline as those who are paid in the hospital,” she said. How does this mobilization work? Why would the government care about students skipping classes or protesting in the streets? It has to do with the impact on the economy, especially in a province where education is as cheap as ours, and where university and CEGEP operating budgets are funded by the provincial government. “During the electoral campaign, the minister of education said he would examine the issue of unpaid internships, so we are following through on this commitment. The gameplan will be respected, the only scenario excluded at the moment is the status quo,” said Francis Bouchard, a press attaché for the Ministry of Education. Students emphasize that they know this tactic works. Past unlimited general strikes like the 2012 Carré Rouge movement actually proved that student strikes are the best way to pressure the government. “In the past, no gain has been made in the student movement without a massive strike movement,” states the website for the Quebec-wide coalition against unpaid internships. In the beginning of February, after a protest held in Quebec City, Roberge said he would be open for discussions and was aware of the situation. “There is a process going on at the ministry right now. The minister is committed to present possible scenarios by the end of April to try to correct the issue of internships,” his press attaché said at the time. On Feb. 19, a consultation was held between the members of the Ministry of Education and Higher Education and several student groups and associations. One month prior, Roberge proposed his gameplan concerning the compensation of internships, and his role in this situation. “Work on this matter is progressing rapidly at the Ministry of Education and Higher Education, and I pledge to submit, by the end of April, the possible scenarios,” he said in a January press release. He also mentioned that his will is to improve the students’ situation. The recent strike week between March 18 and 22 was not the only protest week. According to Gabrielle-Alexandra Hébert, head of student life for UQAM’s education association, many associations held smaller strikes between March 6 and 8. The afternoon of March 7, a small demonstration of approximately 100 people happened in Montreal, in front of Place Émilie-Gamelin. The event was held under the theme “We break down the open doors,” referring to the remarks made by Roberge last November. “Of course, we recognize young people’s right to protest and to express themselves, but I invite them not to break open doors,” said Roberge during that week. “The organization bought doors for the strike and smashed them symbolically,” Hébert shared. 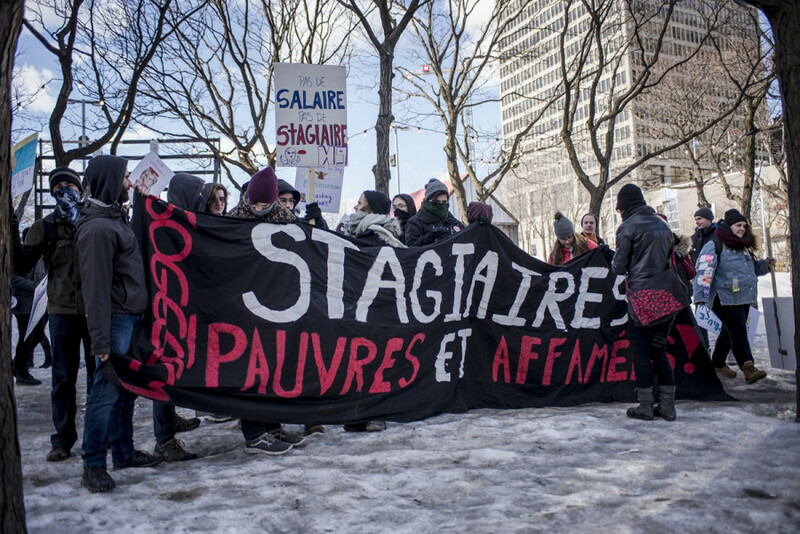 On March 8, a larger demonstration took place for International Women’s Day, but some students also protested at the same time for the cause of unpaid internships according to Hébert, since this issue is often present in in the public and community sectors, sectors led by women. Hébert added that one group also went at the entrance of the Centre hospitalier de l’Université de Montréal with their banners, to pressure the government by reminding them that nursing interns are not paid.